One of these days that 'something' you ghost hunters are looking for is going to find you and it won't be nice! Read your Bible! It talks about how the dead don't come back. These 'things' are demons!. I would say it does look like a face that is in the circle. But the face of the girl looks more like it can come from a statue. 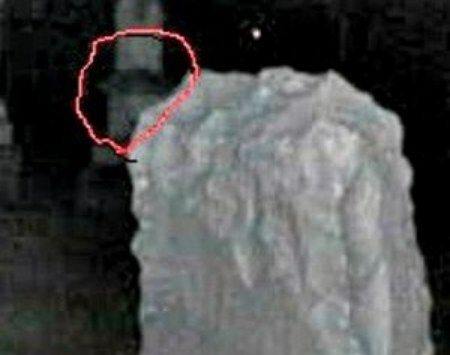 I'm the one who took this pic I am the founder of my ghost hunting group, I thank you for your comments. You will notice in the pic the black hair blocks what is a head stone in the distance behind her. It's as if she was peaking out from behind the head stone, and it depends on what you believe Christians believe when we die we go to heaven . But the Catholic Bible states that the Lord will come down from the right hand side of God to judge the living and the dead. Think about it, I'm not judging Christians, I feel only God can judge us. We do ghost hunting to help people with paranormal problems and we document everything we do and then we help the people with blessing their home. I have witnessed too many things to say spirits are not real. I know angels and demonic forces are real as well. I forgot to add that this is a small cemetery with no statues. Catholic Bible eh? Well there you have it folks! Sorry but the dead don't come back!! God is in charge of our souls. These 'things' are demonic! Grow up and remember: curiosity killed the cat!.